Contrary to rumor, Harry Potter novelist J.K. Rowling is not signed up to ride into space with Virgin Galactic, company founder Sir Richard Branson wrote in a tongue-in-cheek update today (Oct. 2). The bestselling British author was reportedly offered a trip to space for £2 million ($3.2 million) "by parties unknown," Branson wrote, "which she understandably turned down." A further rumor suggested the ride was offered by Virgin Galactic, a Mojave, Calif.-based company selling suborbital spaceflights to take passengers on an arc to space to experience a few minutes of weightlessness, without making a full orbit around Earth. 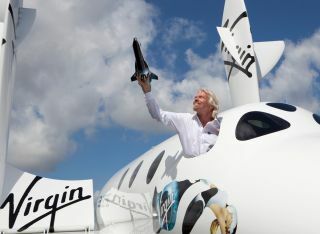 Branson said he was shocked by the story in part because of the purported price of a trip to space. Tickets for Virgin Galactic's SpaceShipTwo space plane are going for the relatively cheap price of $200,000. The company has not yet launched any passengers, but hopes to do so in the next couple of years. Virgin Galactic's SpaceShipTwo flights will carry eight people — two pilots and six passengers — into suborbital space when they become operational. However, £2 million would actually be quite a bargain for orbital space travel. Seven paying passengers have brokered rides aboard Russian spaceships to the International Space Station through the Virginia firm Space Adventures, for price tags ranging from $20 million to $35 million. If Rowling ever does decide to journey beyond Earth, she won't be the first celebrity to do so. Actors Tom Hanks, Brad Pitt and Angelina Jolie have also put down deposits on Virgin Galactic trips, according to USA Today. Ashton Kutcher was the 500th space tourist to sign up with the firm. Branson, a British billionaire who founded not just Virgin Galactic, but its 400 sister companies in the Virgin Group (Virgin Records, Virgin Atlantic Airways, and more), showed off his knowledge of Potterdom in today's blog post, which he titled "A load of old hogwash! Or should that be Hogwarts?" "Amused to see that the Media Muggles have obviously been on the Butterbeer again and created a story straight out of the Ministry of Magic!" he wrote.